Take a look at project and team member news, events, and accomplishments. CPPRN team member, Dr. Benjamin Springgate (left), was invited to present about the Community Resilience Learning Collaborative Research Network (C-LEARN) at the Barataria-Terebone National Estuary Program (BTNEP) Management Conference on February 1st in Thibodaux, Louisiana. C-LEARN, like CPPRN, is a community-engaged project and focuses on community resilience in the wake of both natural and man-made disasters in Southeast Louisiana, including Orleans Parish, East Baton Rouge Parish, and the coastal region of Louisiana. As such, C-LEARN activities rely heavily on and are directed by community partner input and participation. Click here to learn more about C-LEARN. Click here to learn more about BTNEP. 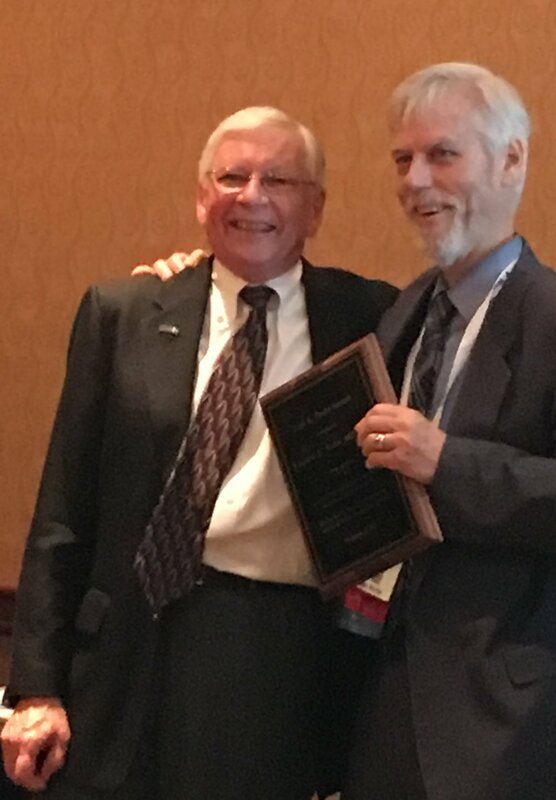 A big congratulations to our own Dr. Ken Wells (right), recipient of the 2017 Carl Taube Award for Lifetime Contribution to the Field of Mental Health! Dr. Wells received this award at this year's American Public Health Association conference in Atlanta. Dr. Wells is a psychiatrist and health services researcher. A pioneer in applying Community-Partnered Participatory Research to behavioral health, Dr. Wells with community partner Loretta Jones boast a decades-long legacy of promoting community engagement and true partnership in mental health research. cpprn team members attend pcori pi retreat in washington d.c.
Community Co-Investigator, Catherine Haywood, and Dr. Benjamin Springgate attended the PCORI PI Retreat in Washington DC last week. Left are Ms. Haywood and PCORI Executive Director, Joe Selby. Drs. Bowen Chung, Ken Wells, Ashley Wennerstrom, and Benjamin Springgate (left to right) presented at the Institute for Psychiatric Services Conference: The Mental Health Services Conference 2017 in New Orleans. The team discussed their previous experience conducting research and providing care for those affected by Hurricane Katrina and the continued need for collaborative care to build resilience in the face of disaster. Coverage of their presentation, is available on Mednet. Dr. Kenneth Wells, Dr. Sheryl Kataoka, and Ms. Felica Jones represented the CPPRN at this year's Martin Luther King Jr. Day Parade in Los Angeles. Dr. Ben Springgate, Ms. Loretta Jones, and Ms. Felica Jones represented the CPPRN at this year's Patient Centered Outcomes Research Institute annual meeting. Ms. Plus dedicated the last 25 years to studying social and cultural determinates of health care to reduce its inequalities. Her goal is to create opportunities for researchers to build a coalition between communities, community based organizations and academia. She is an adviser for Healthy African American Families II in Los Angeles and has a faculty appointment at Charles R Drew University where she sits on their Institutional Review Board. Her current efforts have brought her to the forefront of patient engagement where she is a member of PCORnet’s Engagement Committee, part of the Patient-Centered Outcomes Research Institute (PCORI). She is a leader in elevating community and patient voices at the national level so that these voices can and will be heard in order to impact care. On May 25, 2016, the CPPRN held a joint conference by video between our two sites in Los Angeles and New Orleans. The conference featured an introduction to the CPPRN, opportunity to network with others working in the same field, and special keynote speakers. It was open to the public and was FREE. Click on the video to the left to hear more details from the conference.